For those of you who haven't heard of her, Emily Schuman is a perfectly polished, admirable blogger. She writes about fashion, cooking, home decor and as of late, her new baby Sloan. 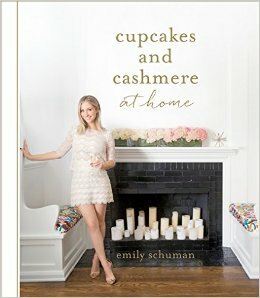 Her blog Cupcakes and Cashmere has always been one that I just love to dive into when I have a spare few minutes so when I found out in 2012 that she was bringing out a book, I just had to get my hands on it. I pored over the pages and became even more obsessed with this woman who seemed to have everything together. A couple of months ago, her second book Cupcakes and Cashmere At Home was published and yet again, it sent me into a state of excitement and longing to have this gorgeous little book on my shelves. The first book focused on all aspects of a polished life, such as fashion, cooking, lifestyle, etc and this one was purely focused on decor and entertaining at home. The decor aspect was my favourite, as it focused on the alterations you can do when you're renting vs when you're buying a home. The first section was all about how you can make your space your own - whether you own it or rent it. With excellent tips I'd never even considered, this guide will be one I'll be diving into again and again in the future. The second part of the book is a guide to entertaining and the different types of 'at home' entertaining that you can do, as well as tips to doing it flawlessly. I couldn't be happier for Emily's success and as it all started from her blog, I feel as though she's one of us in a way. The tips in this book will carry me into the next phase of my life as I buy my own home and this gorgeous book is a perfect addition to my shelves. How You Can Get Involved In Our Next Group Post!